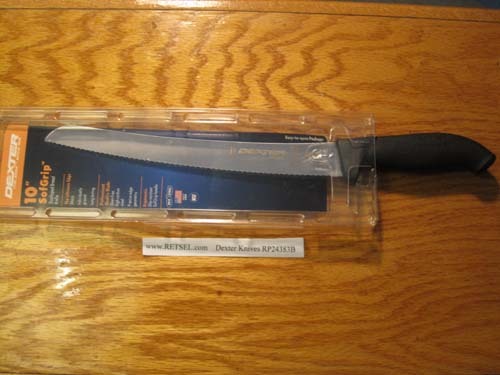 Dexter Russell 10 inch scalloped bread knife, black handle The SOFGRIP™ product line is the standard in non-slip and comfortable design for demanding kitchen environments. A software rubber grip reduces stresses that may cause fatigue and common wrist injuries like carpal tunnel syndrome. Dexter scalloped blades are manufactured from proprietary DEXSTEEL™ stain-free, high-carbon steel are individually ground to create specially designed scallops forming multiple sharp cutting edges. The points of the scallops easily break through rough rinds and pierce the firm skin of fruits and vegetables and also protect the sharp cutting edges. After breaking through the tough outer surface, the curved scalloped edges slice through soft interiors without damaging them. Made in USA. Items marked with the NSF logo are NSF Certified.